Mix Land development with Retail/ Food Court/ Restaurant/ Anchor Shops/ 12 Screen Multiplex. 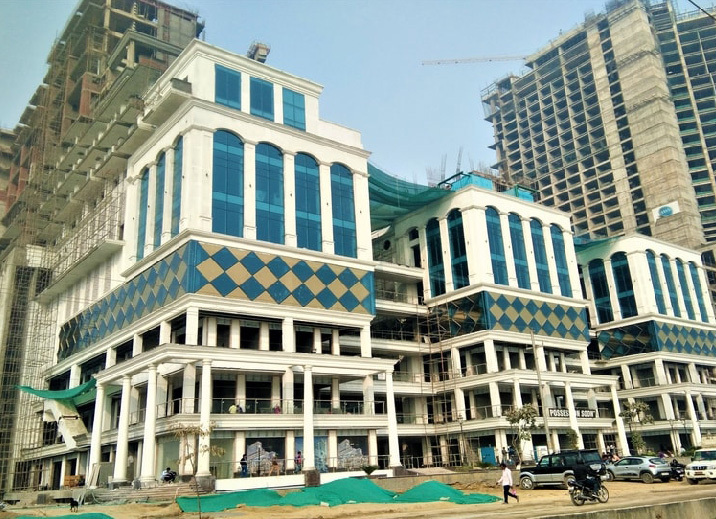 Galaxy Diamond Plaza is a forthcoming commercial property in Sector 4, Noida Extension along the 130m wide high street near Gaur Chowk in Gaur City II. A beautifully constructed architectural splendour to present the largest jewellery market in the city, Galaxy Diamond Plaza Noida Extension is an integrated commercial establishment on 2.5 acres land presenting a huge shopping mall and office spaces and studio apartments to change the socio-economic face of this city. This 5-storey shopping arcade accommodates all advanced commercial solutions like high street retail shops, retail spaces, food court, 5-screen multiplex and so on. Galaxy Diamond Plaza is an iconic creation from the renowned builder brand, Galaxy Group. Kiosk, hyper store, vanilla store etc. Floor size: 261 sq. ft. to 303 sq. ft. Floor size: 425 sq. ft.
•	Synchronized clusters of complementary brands. •	aspires to deliver the best of retail and shopping experience due to its prime location at the very heart of Greater Noida West. •	A large brand mix from premium to daily needs. •	Aesthetically pleasing and operationally efficient architecture. •	Excellent workmanship that lasts for years. •	High-quality finishes & fittings. •	With such outstanding location advantages and affluent neighbourhood, the project is quickly gaining recognition and applause right from its conception. •	Entry to retail from wide road. •	Attractive & Flexible Payment Plans Available. Galaxy Group is a notable real estate brand with a hoard of successfully completed residential and commercial projects in Delhi NCR with special emphasis on Greater Noida, Noida Extension and Noida. In its years long journey, this builder group has completed nearly 50 projects, each of which reflects a touch of innovation, expert craftsmanship and technical proficiency. Dedicated to offer the best investment options for the property investors, Galaxy Group injects a wow factor in its every venture to provide something unique that can stand out in this competitive market. Galaxy Blue Sapphire Plaza is another commercial project in Noida Extension by this builder. © 2017 Galaxy Diamond Plaza. All rights reserved | Disclaimer - This is just an information website and not to be claimed an official site.